With this tutorial, you will able to update your Galaxy S7 Edge G935A (AT&T) to UCU4CRE4 Android 8.0 Oreo Official Firmware. 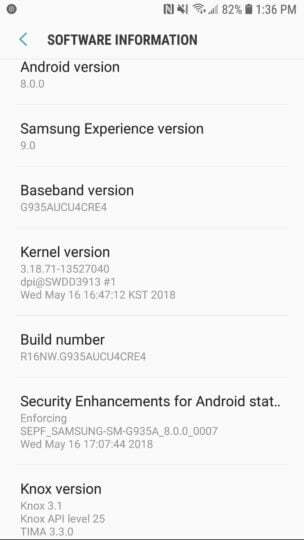 A bit late, but the OEM is finally updating its US variant of Galaxy S7 to Android 8.0 Oreo. The new build brings a lot of improvement, features, and UI changes, which AT&T users can take benefits of it. You can immediately get this update on your device manually using our tutorial below. You don’t need to wait for OTA (Over-the-air) to arrive on your phone. And well, our tutorial will work for both modified and untouched device. That means, our tutorial will work even if you had a custom ROM installed or a rooted device. We have explained the tutorial with some easy step-by-step procedure with Odin tool. All the download links are right ahead — and you can also root Galaxy S7 on UCU4CRE4 firmware. Since this is a major system update, we recommend you to perform a clean flash. Yes, you can update the phone without losing data, but we strongly don’t recommend that because your device may die with bugs. So clean flash with a factory reset is a must to start your device with a fresh off. Cleaning the firmware means removing the unwanted residues and bad configurations which are harming your user experience. Luckily, we have tools like Samsung Smart Switch, which can create a backup of your device. Alternately, you also have an option to pick up some cool backup apps from Play Store. Once you are confident enough that you are safe with your backup, you can proceed to the installation tutorial below. Since this is an Official Firmware by Samsung, your device warranty won’t get void on installing UCU4CRE4 Android 8.0 Oreo. This firmware is device specific and will work only on AT&T Samsung Galaxy S7 Edge. Please do not try with any other variant on Samsung devices. Make sure you have correctly installed AT&T Galaxy S7 USB Driver on your computer. If not, please download it from our USB Driver Section below and install it correctly. Otherwise, your computer will not be able to detect your device. The tutorial will use Odin flash tool. We have mentioned the full step-by-step instructions on How to install UCU4CRE4 Android 8.0 Oreo. If you are entirely new to rooting, flashing a Custom ROM or an Official Firmware, please read the entire tutorial once before actually performing it on your device. Please read the tutorial from the link above to install UCU4CRE4 Android 8.0 Oreo. The procedure has been described properly with screenshots. If you got stuck somewhere, drop your comment below, and we will help you as soon as possible. I have downloaded the zip file from Androidfilehost.com, and inside it, the AP file has extension .meta.tar. So the md5 is missing. Have you checked this? Does it work anyway with no checksum? Yes, I have checked it! It works perfectly without md5.